Bartending is a profession that can greatly vary depending on what type of atmosphere you are in and what sort of expectations you have. That being said, bartending can be a very rewarding profession financially for those that are willing to put in the effort to hone their craft. If you are wondering how much a bartender makes, keep in mind that there is plenty of factors that go into that answer. Here is a look into what those factors are. More than half of the money you make as a bartender is going to come from your tips. That means that whether you are having a good day or a bad day in your personal life, you always have to be able to put on a smile and please the customer once you get behind the bar. When bars and restaurants look for a potential bartender, they look for people who are personable, fun, charismatic and can keep a conversation going. After all, the longer you can keep a patron at the bar, the more they’ll likely end up drinking. If you want to be successful in bartending and make the time worth your efforts, then you need to figure out how to maximize your tips. • Making a patron wait on their drink. The customer wants to be there to drink and the last thing they want to do is wait for you. The longer you make them wait, the more they’ll be thinking in their mind how much they should deduct from your tip. • Getting the drink order wrong. You have one job and one job only. That is to assure that the drink you make is the drink the customer asked for. If you fail to do so, you can expect to see it reflected in the tip you get. • Not being personable enough. Bartenders are more than just people who pour drinks. In some cases, they can be the only person who will listen as someone sips on a beer or scotch. Sure, you aren’t getting paid to be someone’s psychologist, but the more you listen the more you’ll likely get paid for your time. • Being too personable. Keep in mind that the people across the bar from you are customers. That means that no matter how much they tell you, they may not want the same information back. If you start opening up about your love life or personal issues, your customer may ask for their tab and head to the bar next door. Even the greatest bartenders in the world are limited to making the amount of money that comes through the door. That means that you should aim for a bartending job that is going to get plenty of customers that can make for high tips. Most of the time, these jobs are in big cities and touristy locations. Another great option is at airports. After all, what better way to wait for your connecting flight than with a nice cold one? Be sure that if you are going to get into the industry, you look to find a place that is worth the effort. Nobody wants to bartend at a place where you only get the same five customers every night, most of which know you so well that they think tipping is no longer required. In some cases, a bartender may not have the experience that is required to land one of those jobs in a big city. That means that they’ll have to take a gig in a smaller bar until they can work their way up. However, it’s important that the first job doesn’t become the only one. Instead, bartenders should be looking to improve and move up in the bartending world. 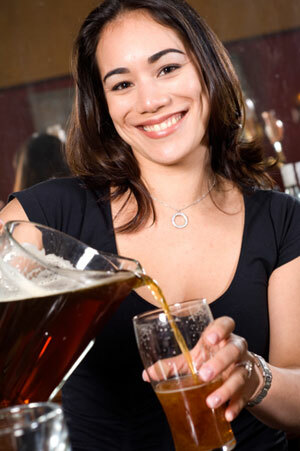 The more you move up in the bartending world, the more money is going to be available to be made. There are very few limits in terms of how much a bartender can make. At one of those dive bars mentioned earlier, maybe $100 is considered a good night. However, in more populated and busy places, you may not be surprised to pull down $1,000 on occasion. But if you want to reach the higher end of the pay scale, then you need to be willing to put in the time and effort in the industry. That, and make sure you always get your drink order right. Cheers!